Debt to income ratios - Robert Weaver, Security Mortgage Co.
Shopping for a mortgage? We will be glad to help! Give us a call at 972.359.7766. Ready to get started? Apply Now. For the most part, conventional mortgages require a qualifying ratio of 28/36. FHA loans are a little less strict, requiring a 29/41 ratio. The first number in a qualifying ratio is the maximum amount (as a percentage) of your gross monthly income that can be applied to housing (including mortgage principal and interest, PMI, hazard insurance, taxes, and HOA dues). The second number in the ratio is the maximum percentage of your gross monthly income that can be spent on housing expenses and recurring debt. 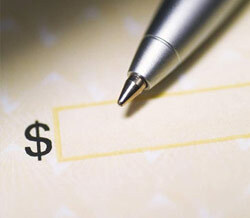 Recurring debt includes payments on credit cards, auto payments, child support, et cetera. If you want to calculate pre-qualification numbers on your own income and expenses, please use this Mortgage Pre-Qualifying Calculator. Don't forget these ratios are only guidelines. We'd be thrilled to go over pre-qualification to help you determine how large a mortgage you can afford. At Security Mortgage Co, we answer questions about qualifying all the time. Call us: 972.359.7766.